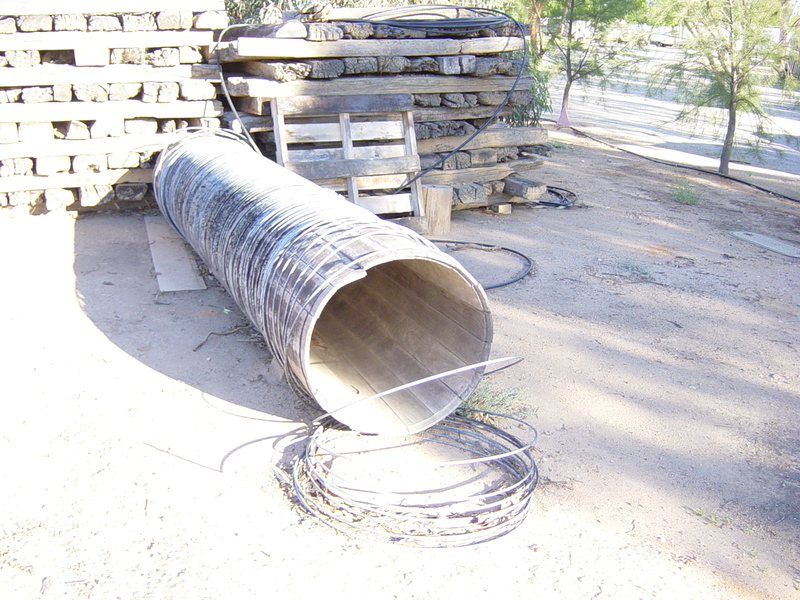 A persistent myth surrounds the type of pipes used in the Goldfields Water Supply Scheme. The original pipes were not made of wood. Wooden pipes came later but many people alive today can recall seeing sections or remnants of them and so the myth continues. In fact, the original pipes – made of steel – were buried and only relaid above ground in the 1930s which was when the wooden pipe came into its own. Many people believe the original pipes used in the goldfields water supply were made of wood. Not so, it was only in the 1930s that wooden pipes were used in the main conduit and then only for short sections. The original pipeline was all steel. At the time it was the longest pipeline in the world and, although that is no longer true, we can still boast being the longest steel pipeline in the world. But steel brings with it problems and corrosion – both internal and external – was a problem with the pipes almost from the outset. By 1930 it was obvious that, without substantial reconditioning, the days of the pipeline’s active service were numbered. In year 1931-32, the number of bursts on the main conduit due to corrosion reached an all time high of 14 326, which was more than double the number in 1928-9 and represented an average of 39 every day for the year. It was to be an army of unemployed (men out of work thanks to Great Depression) that saved the pipeline, relaying it above ground. Some of the original steel pipes were badly corroded and replaced with wooden pipes, assembled in the same manner as wooden barrels. The Goldfields Water Supply Department first used wooden pipes in 1912 when about 800 metres of 20 inch (508 mm) Oregon pipe was used at the Toorak Hill bypass in Coolgardie. The trial, however, was not a success. The pipe was subject to dry rot and termite damage and leaked profusely. So why were they used in the 1930s? The answer has to do with lack of state money to buy steel pipes from overseas at the time combined with a campaign (led largely by their wives) to keep workers at a wooden pipe factory employed. At the height of the Great Depression in the early 1930s the Department was under enormous pressure to replace damaged steel pipes with pipes made from karri wood in an attempt to provide jobs and stimulate the local timber industry. The Department was reluctant and it was only after 2½ years of testing that wood stave pipes were first connected to the main pipeline. 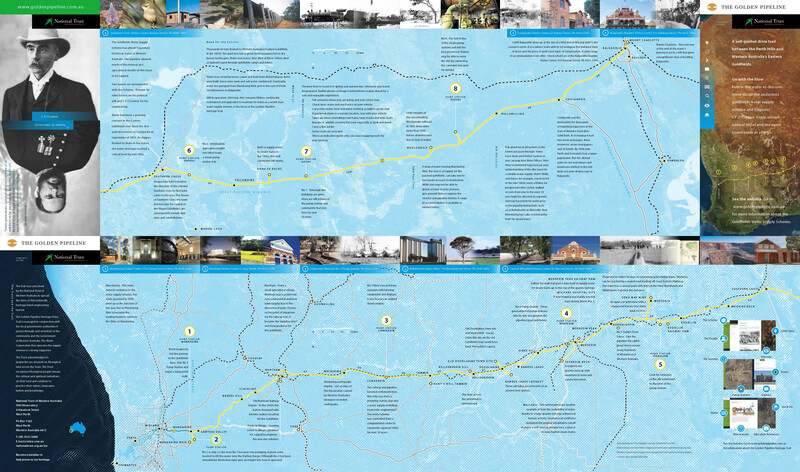 Between 1933 and 1937 approximately 33 km of 24 inch (609 mm) and 30 km of 30 inch (762 mm) karri stave pipes were laid as part of the main line. A further 8.8 km of 10 inch (254 mm) wood pipes were used for branch lines. The pipe lengths varied from 1.5 m to 6.6 m according to the available timber. The 5 inch (127 mm) wide staves were treated with sodium fluoride and kiln dried before being bound with galvanised wire, covered in tar and bitumen, and dipped in whitewash. Before installation they were closed at each end and filled with water to allow the staves to expand and seal the pipe. The last section of wood pipe remained in use until 1968 and this is no doubt the reason for the myth of the original pipe being made of wood. While the original pipeline was buried, the wooden pipes were installed when it was relaid above ground and people alive today can remember seeing wooden pipes in situ. In many parts as you drive along Great Eastern Highway to the Eastern Goldfields, the trench in which the original pipeline was buried is still clearly visible. Less easily seen, but sometimes spotted, are the remains of some of the wooden pipes laid in the 1930s in the shape of rotted staves and the wire that bound them. Wood pipes were more easily damaged than steel pipes. Stories are told of thirsty donkeys that kicked holes in the pipe to get to the water. And wood was much less of a barrier to a wayward car. In 1949, for example, 445 000 litres of water was lost when a car ran off the road near Southern Cross and hit the 24 inch wood pipe.